Our friend Joyce (Charlie's nephew's wife's mom) invited us for lunch in January 2015 and served us this quiche. We really liked it and asked for the recipe. We were surprised how easy it is to make. Joyce's name for the recipe is Proznick but we have renamed it as above. (We considered Joyce's Krustless Kosher Keesh.) If we make tweaks to the recipe, we'll note them below but cannot guarantee it will still be kosher! Makes about 8 generous servings. It keeps well left over but if you don't want leftovers, would be easy to half the recipe. 1 10-oz package frozen broccoli or spinach, defrosted. Also see variations below. 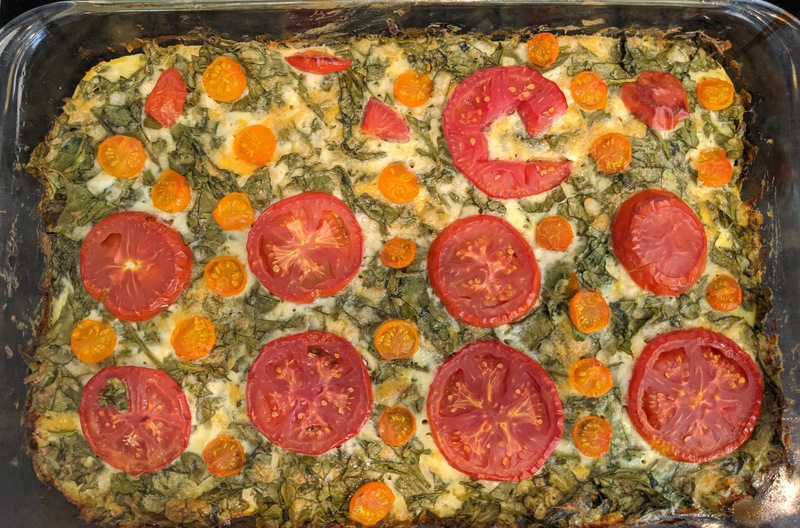 Possibly use fresh spinach, kale instead of spinach, or add onion and garlic to the mixture. Important Note: There is plenty of salt in the cheese, etc. Do not add salt. Combine well the cottage cheese, eggs, butter, flour, cheese. Pour into a greased 9 x 13 pan or two greased pie plates. Bake, uncovered, for one hour, or till it is golden brown on top. Use fresh spinach instead of frozen. Saute very lightly till very slightly wilted. It just takes a minute, don't overcook. Then stir into mixture. Use fresh kale instead of spinach. Cut out stems, chop to 1 or 2 square inch size pieces. Saute till starts to very lightly wilt before adding to mixture. Chop then sautee an onion and add to the mixture. Add very lightly sauteed garlic (2 or 3 large cloves minced or crushed) to the mixture. Add sauteed mushrooms to the mixture.